I wanted to take a moment and thank you all for reading my blog. I resisted blogging for a long time because I wasn’t sure I could “do it right.” I’m still not sure I’m “doing it right,” but at least I’m doing it. For those of you who have stuck with me the last 5 months (can you believe that’s all it’s been? ), THANK YOU! 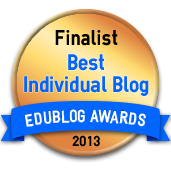 In the last few months, this blog has been named a finalist in the Edublog Awards (one of the top 5 in new blogs!!!). We’ve been named One of the top 15 SLP websites according to my friend Erik X Raj..(and I have to tell you – that is special to me. I think the world of Erik and value his opinion a lot. When I read his post, it made me tear up a bit.) We’ve also been named one of the top 100 Best Websites for SLPs. Now, I don’t want to toot my own horn or anything here…but WOW! I am incredibly honored and pleased to have been recognized like this. Thank you ALL for nominating, voting, talking, commenting, posting, tweeting, and all the wonderful things you do. You inspire me…you make me think and ponder…and you lead me to take action. Without each of you none of this would be happening. I received an email today from WordPress…and it was about the stats for my site. I thought I’d share it with you all. I found it ...interesting…entertaining. I can’t wait to see what 2013 brings! « Adventures in Certification…part two. Congrats, Mary, A very well deserved honor; as a CF, I really value all of the information you willingly share! Thank you and Happy New Year!! Smiling broadly and offering up a “High 5”! Way to go Mary!